A VPN for Nvidia Shield improves your online privacy and lets you access content restricted to specific countries. 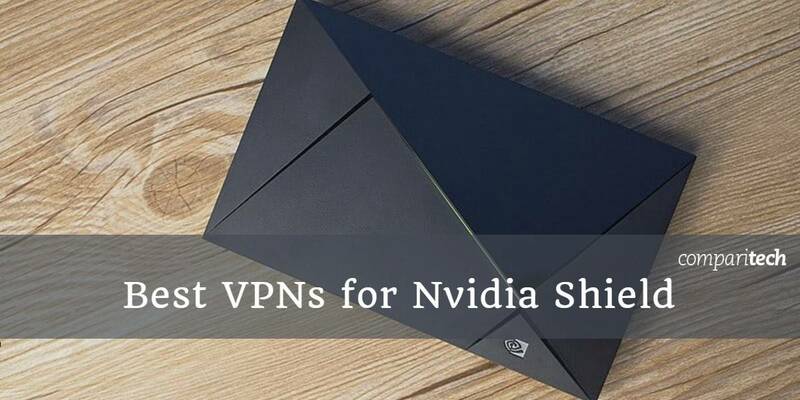 In this article, we'll cover how to set up a VPN on your Nvidia Shield, what it can do, and our top recommendations for the best Nvidia Shield VPNs. A VPN encrypts your internet connection and routes it through an intermediary server in a location of your choosing. When combined with an Nvidia Shield, it enables you to safely stream video and other media that’s normally restricted to other countries. You can access the American Netflix library or the UK-only BBC iPlayer, for example. If you’re a Kodi user, all of the VPNs we recommend work with every Kodi addon we’ve tested. ExpressVPN: Our top recommendation. Fast servers in 94 countries, robust security, and unblocks a wide range of geo-blocked streaming sites. NordVPN: Good budget choice. Tons of servers and good speeds. Zero logs. Unblocks Netflix and other streaming sites. CyberGhost: Great security and speeds at a decent price. Makes it easy to unblock streaming sites. PrivateVPN: Fast connections and great for unblocking streaming sites. Good security and no logs. IPVanish: Strong security, decent speeds, and works great with Kodi. No logs. Nvidia Shield runs on Android TV, so we’ll mainly be looking at VPNs with Android TV apps on Google Play. ExpressVPN makes an Android TV app that can be installed on Nvidia Shield right from the Google Play Store. If that’s not an option for some reason, you can download the APK installer file directly from the ExpressVPN website. ExpressVPN boasts fast speeds and robust security. You can stream content from dozens of countries including Netflix, BBC iPlayer, Hulu, and Amazon Prime Video. Live chat support is available 24/7 should you encounter any issues. ExpressVPN allows subscribers to connect up to three devices at a time, so in addition to your Shield, you could make use of some of the apps available for Windows, MacOS, iOS, Android, Linux, Amazon Fire TV, and certain wifi routers. BEST FOR NVIDIA SHIELD:ExpressVPN is our top choice. A great all-round VPN for streaming and privacy, plus it comes with a risk-free 30-day money-back guarantee. NordVPN makes an Android TV app available from the Google Play Store along with the alternative option to download the Android APK directly from its website. It’s also available on the Amazon App Store if you happen to use that as an alternative. NordVPN operates more than 5,000 servers in over 60 countries, and it’s great for unblocking geographically restricted content like Netflix, Amazon Prime Video, BBC iPlayer, and Hulu. You get speeds fast enough to stream video in HD as well as strong encryption to keep your viewing private. NordVPN adheres to a strict zero-logs policy, so it doesn’t record any information about what you do while connected. You may connect up to six devices at a time on a standard subscription. NordVPN is also available for Windows, MacOS, iOS, Android, Amazon Fire TV, and Linux. BEST BUDGET OPTION:NordVPN offers all the benefits of a premium VPN at a low price, and it comes with a 30-day money-back guarantee. CyberGhost makes an app for Android TV that helps you easily stream favorites like Netflix, BBC iPlayer, and Amazon Prime Video. You can either choose a server location or select which streaming service you want to unblock from a list. That means there’s no trial and error, messaging customer service, or searching the web to figure out which servers work with a particular service. CyberGhost scores high for both security and speed. It’s the fastest VPN of 2019 based on our tests and earned a perfect score in our annual privacy assessment. The company stores no logs of your activity or connections. In addition to Android TV, apps are available for Windows, MacOS, iOS, Android, and Amazon Fire TV. You can connect up to seven devices at a time. FASTEST FOR NVIDIA SHIELD:CyberGhost is the fastest VPN we’ve tested this year, and it comes with a 45-day money-back guarantee. PrivateVPN’s Android TV app is the same as the phone app, but it works fine on both big and small screens. An APK file is available from the website in case Google Play is not available for some reason. PrivateVPN is a smaller provider than the others on this list, but it punches well above its weight class in terms of speed. It’s great for unblocking geo-restricted content; in particular, it unblocks more international Netflix libraries than any other VPN we’ve tested. Security is what you’d expect from a veteran provider, and PrivateVPN doesn’t store any logs of your activity or connection. You may connect up to six devices at the same time on a standard subscription. Apps are also available for Windows, MacOS, iOS, Android, and Amazon Fire TV. KEEP IT SIMPLE:PrivateVPN offers an intuitive and straightforward app with all the features you would expect from a much larger provider. Comes with a 30-day money-back guarantee. IPVanish’s Android TV app is available on Google Play, and an APK file is available as a backup option direct from IPV’s website. This provider offers robust security and doesn’t keep any logs of what you do while connected to its servers. It operates a large server network spanning more than 54 countries. Speeds are decent and connections are stable. IPVanish is easy to use but comes with a fair amount of customization if you want to delve into the settings options. This service isn’t as capable as some competitors when it comes to unblocking streaming sites, but it’s a favorite among Kodi users. It works with all the Kodi addons we’ve tested. You can connect up to 10 devices at a time, more than any other VPN on this list. Apps are also available for Windows, MacOS, iOS, Android, and Amazon Fire TV. COMBINE WITH KODI:IPVanish works great with Kodi addons and offers robust security on every connection. It comes with a 7-day money-back guarantee. Nvidia Shield runs on Android TV, which is a TV-compatible version of the Android operating system used on a lot of today’s smartphones. Android TV has its own partitioned section of the Google Play Store, which means a smaller selection of apps than you’d get for a phone. On your Shield, open the Google Play Store from the Apps section of the home screen. Search for the name of your VPN. It should show up in the search results. Select your VPN from the list to open its app page. If there are multiple VPNs with the same name, make sure to check which is the official version. Accept the app permissions to complete the install. You can now open the VPN app from the home screen and sign in. Just select a location and hit Connect to get started. On a PC or Macbook, open a web browser and go to your VPN provider’s website. Download the Android APK file for your VPN app onto a USB flash drive. If you cannot find the download page, consult your provider’s customer service. Safely eject the flash drive from your computer once the download is complete. On your Shield, go to Settings > Security and Restrictions. Toggle on Unknown sources. Press OK when a warning appears. From the home screen, open Google Play (or whatever alternative app store you have access to, e.g. Amazon). Search for and select ES File Explorer or FX File Explorer. Either one should work. On the app page, select Install and Accept the app permissions. Insert your USB flash drive into the Shield. Open the file explorer app you just installed and navigate to your USB drive or media card. Open the APK file you downloaded from your VPN provider’s website. When the installation finishes, select Open. You can now use the Android VPN app on your Shield. Note that this version of the app is probably made for phones and not TVs, so navigating the interface might not be so intuitive. You should be able to sign in and connect to a server, though. Can I use a free VPN with Nvidia Shield? You might come across a few free VPN apps in the Google Play Store, but we don’t recommend them. Free VPNs tend to have congested servers that are too slow for streaming video. Data caps and bandwidth limits lead to interrupted videos. Free VPNs often make money by harvesting your data and selling it to third-party advertisers, which runs counter to the privacy that a good VPN should provide. Some, particularly on Android, even carry malware. Stick with a paid VPN for a more seamless experience, fast speeds, better privacy, and customer support that’s ready when you need it. 8 Can I use a free VPN with Nvidia Shield?